Is Head and Shoulders Safe for Kids? Home » Beauty Care » Is Head and Shoulders Safe for Kids? 3. Is Head and Shoulders Safe for Kids? 3.2. So, Is Head and Shoulders Safe for Kids? 5.1. Is Dandruff Common in Children? 5.2. What Causes Dandruff in Children? Amongst various brands providing anti-dandruff shampoos out there, Head and Shoulders stands out to be one of the best. Their products work well on both men and women, but many parents still wonder “is Head and Shoulders safe for kids”. If you have that same question, don’t worry because you can find out the answer right on this post. Furthermore, we know that many parents hesitate in using anti-dandruff shampoo for their kids. That’s because the immature body of children is pretty sensitive to some chemical products. So, in this post, we will also show you how to use anti-dandruff shampoos for kids in the proper way to bring out the best result. Let’s get started! 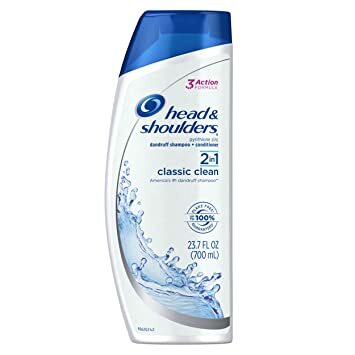 Introduced in 1961, the American brand Head and Shoulders provides a variety of products, but they’re most well-known for shampoos. From the 1980s until now, they always have products honored in the list of BEST ANTI-DANDRUFF SHAMPOO FOR MEN and BEST SHAMPOO FOR DRY SCALP, which expanded their name from the US to Europe, Asia, and other regions. There are clear advantages when using anti-dandruff shampoos by Head and Shoulders. Not only do they help you get rid of dandruff effectively, but they also aim to make your hair look great and smell great, as well as keep your scalp healthy and comfortable. But whether Head and Shoulders is safe for kids is another totally different story. Let’s take a close look at the ingredients used in their anti-dandruff shampoos to find out! For every personal care product, especially the one for kids, it’s essential to understand all of the major ingredients made of the product before using. Therefore, before giving you the correct answer to the question “Is Head and Shoulders safe for kids”, we’d better explore major ingredients widely used in Head and Shoulders anti-dandruff shampoos and keep an eye on the possible side effects of each ingredient. In general, Head and Shoulders anti-dandruff shampoos contain the following main ingredients: dandruff fighters, nourishing and lather-building agents, cleansers, stabilizers and preservatives. In addition, there are substances for good smell, as well as for adjusting texture and consistency. It can treat symptoms like flakes or inflammations, and it can also tackle the root of the problem by preventing the symptoms from reappearing. Although zinc pyrithione is the common substance that tends to bring out less negative side effects than other substances used for fighting dandruff, it might irritate skin. Luckily, this side effect has rarely been reported . Labelled as the special ingredient that no other shampoos offer, zinc carbonate in Head and Shoulders helps with fighting dryness for the healthy scalp as it protects the zinc pyrithione and keeps it in the most effective form. However, like zinc pyrithione, zinc carbonate rarely causes irritation of skin . There is research presented that this detergent is linked to cancer, but this is not proven clearly and still considered an unfounded danger. However, one thing to be sure is that sodium lauryl sulfate can irritate skin, resulting in eczema and dry skin . If it contacts to the eyes of babies, it might become dangerous because of the increased susceptibility of absorption. Especially, the combination of sodium laureth sulfate and nitrogen-based ingredients might yield to nitrate formation – the cause of skin irritation, scalp scurf and rash . It helps to soothe and keep your hair soft and shiny, as well as to reduce inflammation and irritation. According to the FDA, dimethicone is safe to use in personal care products, and the Skin Deep Database claims that it comes with very low hazard risks of slight dryness and allergic reactions . It is derived from the guar bean and has the capability of preventing the hair from being tangled by making it more manageable. In terms of the side effect, this substance gets an EWG score of 1 and a rating of GOOD from Paula’s Choice, which means it’s very safe to use . Thanks to it, every single drop gets the right blend of ingredients. According to the Cosmetic Database, glycol stearate has a low hazard. It has been tested in human and resulted in not an irritant to the skin. However, the Chemical Book states that it might be weakly irritant to the eye area . It’s used to stabilize the zinc carbonate. According to the EWG’s Skin Deep, this substance has the overall hazard of LOW, no any links to allergies, toxicity and cancer, which means it’s safe to use . They keep the raw ingredients from being contaminated. At the right concentrations (less than 10% of benzyl alcohol and 5% of sodium benzoate), there are no finds of reproductive or developmental toxicity . These preservatives come in a pair to protect the shampoo when you use the bottle at home. At the concentration of lower than 100 ppm (0.01%), they’re safe to add to rinse-off cosmetic products such as shampoo . So, Is Head and Shoulders Safe for Kids? From these above side effects, does it mean Head and Shoulders anti-dandruff shampoos are not safe for kids? Well, NOT exactly! Skin irritation is just a minor side effect, not mention to being rarely been reported. While the dandruff-fighting agents can give you the peace of mind, other chemical agents should be taken into consideration. Luckily, they trigger negative effects only when they’re used in excessive concentrations or when they directly contact to the baby’s eyes. Moreover, the pedestrians DO prescript Head and Shoulders shampoo to treat dandruff in children, so it is safe for kids. Living up to the reputation, the brand has been receiving thousands of positive feedbacks that their products work well for kids. They also confirm NO paraben in every product, and other chemical agents are all in the allowed range. However, according to their website, they give a warning to parents that they should consult with a pediatrician for diagnosis and treatment options before any usage of shampoo for kids. Besides, as a parent, you must be very careful when using any kinds of soaps or detergents for your kids, especially babies. Never let any drop of shampoo run into their eyes and never exceed the recommended dosage. Also, do research by yourself and check the product label carefully to make sure all the chemical ingredients are in the allowed range. For first-time users, it is best to test the shampoo before applying it to the sensitive skin of your babies. The back of the neck is a recommended area for testing. If there is no reaction observed after leaving the shampoo on this area after about 15 minutes, it is a good sign. Since anti-dandruff shampoos can contain chemicals that cause harmful side effect, take great care of your kid while using them. Make sure you rinse the kid’s eyes thoroughly or even call a doctor for help if any accidents occur. Using anti-dandruff shampoos frequently is the way to ensure its result. However, because these products contain ingredients that specifically aim to fight dandruff, using them every day can be too much for the scalp. Also, do not leave the shampoo on the scalp for too long and rinse it very thoroughly. After the dandruff condition gets better, you can reduce the use of anti-dandruff shampoo. You need to be aware of how a certain type of anti-dandruff product works, for example, searching the answer to the question “Is Head and Shoulders safe for kids? You can try different options before settling on the right type for you. You may even switch the shampoo if it does not prove to be effective after about 6-8 weeks of usage. It seems obvious, but many parents still forget to read the label carefully. If there is anything unclear about the product, contact the doctor for professional advice. Last but not least, do not expect immediate results after using your anti-dandruff shampoo for a couple of times only. For HOW LONG DOES IT TAKES TO GET RID OF DANDRUFF, there is no exact answer. But in general, it takes at least about two weeks before you can notice any remarkable difference. Is Dandruff Common in Children? The answer is NO, but it does happen! You might surprise that over 50% of the world population suffers from dandruff. People encounter this unpleasant chronic scalp condition mostly at their teenage (puberty age) due to the hormonal change, but some children (about 11 years old or less) have that problem even sooner. In other words, dandruff is rare among infants, babies, and young children because it mostly begins in puberty. As a parent, you should also note that your kids might suffer from dandruff-like symptoms such as cradle cap, but not dandruff. So, if you suspect that they have dandruff, it’s recommended to consult with a pediatrician for diagnosis before applying any treatments. What Causes Dandruff in Children? The lack of moisture and the usage of heating equipment in households, especially during winter, may lead to the overly dry skin in children. This is among the most common causes of dandruff in kids. Also known as infantile seborrheic dermatitis, cradle cap is harmless, not contagious, but it may be very itchy and uncomfortable to the children. Besides, it may appear around the ears, eyebrows, eyelids, armpits and other creases. In addition, some experts believe that a hormone from the mother at the end of the pregnancy can cause dandruff in infants. This hormone will later over-stimulate the oil produced in the toddler ages. Besides, according to a study, boys have the greater chance to encounter this problem than girls. Commonly found on the scalp, this fungus can be responsible for dandruff in children. Due to hormonal changes or illness, the malassezia outgrows excessively. The new skin cells develop more than normal and push the old ones clump together to form the white flakes on the head and hairs. Eczema is a common condition among young children at the rate of 20%. It can show up in anywhere on the child’s body including the head. The skin becomes dry, scaly and cracked. The itchiness may be intense in some cases and may cause infections if scratched. Unlike adults, children may be highly sensitive to hair products, even products for kids. That sensitivity is called contact dermatitis, causing the scalp to flake and leading to dandruff conditions. The CAUSE OF DANDRUFF in children is various, and in some cases, this might be a combination of various factors including genes, dry/cold weather, yeast inhabiting on the skin or chemical irritants, leading to overproduction of the oil on the skin. As a popular and trusted shampoo brand, “Is Head and Shoulders safe for kids” is a matter of interest for many people. We did research and we found that Head and Shoulders is safe to use, not only for adults but also for kids. The only concern here is that you – as the parent – must be really careful when using it for your child, as we mentioned above. Hopefully, this article has provided you with useful information to help you decide that matter by yourself and make the right decision for your kids. If you find this information helpful, don’t forget to LIKE and SHARE this article! Leave us comments if you have any question, we are pleased to help!